Bob Nye’s high school ambition was to become an architectural engineer. He became an architect all right, but of winning athletic teams—not buildings. Ney’s College of Wooster golf and soccer teams have won nationwide acclaim and he has been honored with posts of national importance. A native of Springfield, Mass., Bob showed early promise as a golfer. He won the Western Massachusetts Championship while in high school. He also played some top level independent basketball. However, he spent so much time helping other people with their golf game that his mother suggested that he consider a teaching career. He decided to do so, and enrolled at Springfield College. The Korean War interrupted his education for two ears, but his basketball prowess gained him all regimental status and exempted him from other duties. He returned to Springfield and completed the graduate and post-graduate work. Along the way he received his introduction to soccer, playing on the 1957 National Championship team. Since the Chiefs did not have a golf team, he played in the community, becoming president of the Springfield Memorial Golf Association at the age of 23. After graduation Nye introduced soccer to Bloomfield (N. J.) High School. After just two years, his team gained the state finals in one of the nation’s hotbeds of soccer. To prove that it was no fluke, he repeated a year later. 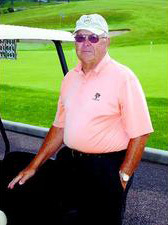 His golf team won three conference crowns and two state championships. Five of his players became professionals. Bob came to Wooster in the fall of 1964 and immediately proceeded to put the golf and soccer teams on the map. His booters won five Ohio Conference titles. Eight of his teams have advanced to post-season play, and his 1977 team placed fourth in the nation. Seven players have gained All-American status. His golf teams have participated in 10 of 11 National Championships Nine were successive. Both achievements probably stand alone in NCAA annals. The 1975 team won the National Championship, the only Scot entry ever to go all the way. Twelve players have been named to the all-American ranks. Bob is presently serving his first year of a two-year term as president of the National Soccer Coaches of America. Earlier this year he received a signal honor in a Letter of Commendation for the National Soccer Coaches Association.